Then the rationalization portion of my brain kicked in. Secondly, art and history are linked. They both fall under the humanities. The humanities help us to understand what it means to be human. Both museum exhibits and works of art can give us insights into the human condition. Thirdly, the decorated gourds the artists submitted are superb. The unique display of the gourds in the gallery has the potential to boost community awareness of the museum. 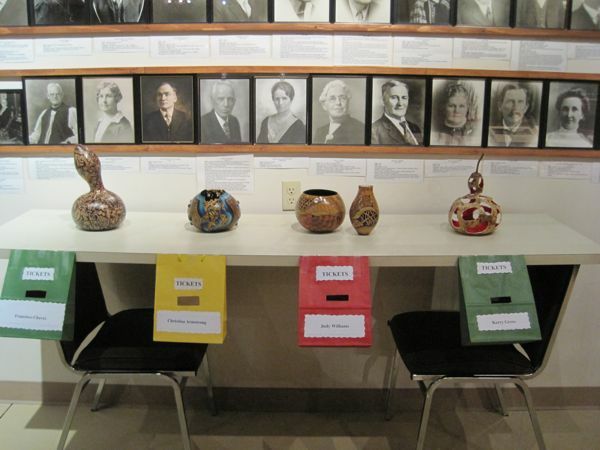 The gourd auction has the potential to improve the museum’s finances. Despite the news coverage and the photos on the museum Facebook page and events website, the message still isn’t getting through to everyone. These are FINE ART gourds, folks. 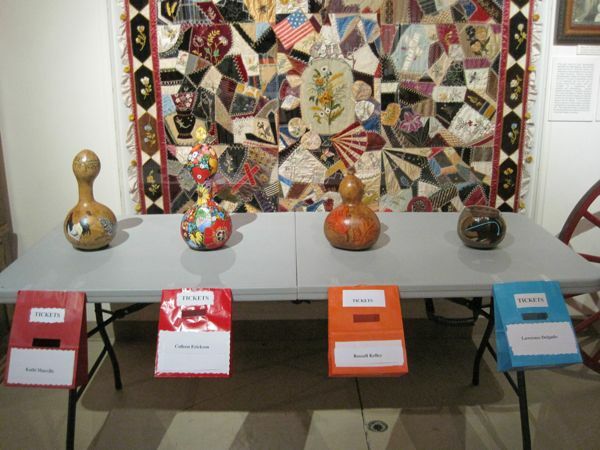 Here are four of the gourds in front of the museum’s Simmons crazy quilt (which was once invited to be part of a display in the Smithsonian Institution). Here are four gourds in front of the museum’s Heritage Wall (where area residents have sponsored the installation of photos and short bios of their ancestors). Notice the bags hanging in front of the gourds that say “tickets”? For every dollar you donate to the museum through October 21 (museum open M-F 9 a.m. to 4 p.m. and Sat-Sun 1 to 4 p.m.), you get a ticket you can use to vote for your favorite gourds. (I use the plural noun because it is impossible to pick a single favorite.) The top-scoring gourd will earn the “people’s choice” honor. The big financial boost for the museum (so we hope!) will come Sunday, October 23, when the gourds are sold at live auction during the museum’s 50th birthday party. The party runs from 1 to 4 p.m., the auction starts at 3. That’s 43 gourds to be auctioned. We really, really need museum supporters and art aficionados to turn out on October 23 with their checkbooks in hand. Let no gourd go unsold! Preliminarily, things are looking promising. There have already been inquiries about phoning in bids for art buyers who cannot attend the auction in person. I want to to end this post with a BIG THANK YOU to the artists who gave of their time and talent, to the high school art teachers who took on this project for their students, and to the gourd grower. You all rock! UPDATE: the 10/9/11 Star-Herald has a great story on the high school student gourds on the youth page (the back page of the Family Album section). UPDATE: North Platte Valley Museum permanently closed in 2013 to join forces with the former Farm And Ranch Museum to become Legacy of the Plains Museum at 2930 Old Oregon Trail in Gering. See the Legacy of the Plains Museum website for the most recent updates. ← Mushrooms . . . or zombie fingers? So enjoy your blog, revisiting my old hometown thru your eyes! I would be first in line at the auction if we could get there – PLEASE try to figure out a phone or online auction option and I will be there!